Iconic guitar models set the trends for what a guitar should represent from the perspectives of body design, playability, and sound. Fender’s Stratocaster and Telecaster models, and Gibson’s Les Paul and ES335, are among the most widely recognized, each with its own body style, feel, and tone. When it comes to hard rock and metal, there’s another icon known the world over — the Jackson Soloist. Easily recognized from its Soloist double-cutaway body, Shark Fin inlays, and pointed headstock, the guitar helped set the stage for what is known as the “Shredder” guitarist, playing blistering lead lines and crossing over from rock to metal in the ‘80s. The Soloist SL2H-MHAQ is perhaps the “classiest” looking, most refined member of the Soloist series with its spectacular quilted maple top, and it would be a great axe for guitarists in more traditional rock and pop settings, too, thanks to a proven combination of wood and hardware. Featuring a very comfortable and highly-playable compound radius fingerboard, the Soloist is easy to strum in the open positions, and the neck flattens out as you scale the fretboard to unleash your inner shred demon. Although we prefer necks with a natural wood finish instead of the full gloss treatment found here, if you like to rock, this guitar will deliver anything you can possibly throw at it. Our review model began to impress us right out of the shipping box – and we hadn’t even seen the guitar yet! The Soloist SL2H-MHAQ ships in a premium Jackson/SKB molded flight case equipped with a TSA security locking system, rubber seal to keep out water, and a pressure release valve for high altitudes. Opening the case, however, was like opening a precious jewel case, or perhaps a treasure chest that had just been dug up from the sand. The first thing to catch our eye was the Burnt Cherry Sunburst quilted maple top with matching headstock. The deep rich coloring and quilting of the maple top provided a soft three-dimensional texture much like blooming cloud formations seen at your favorite beach. 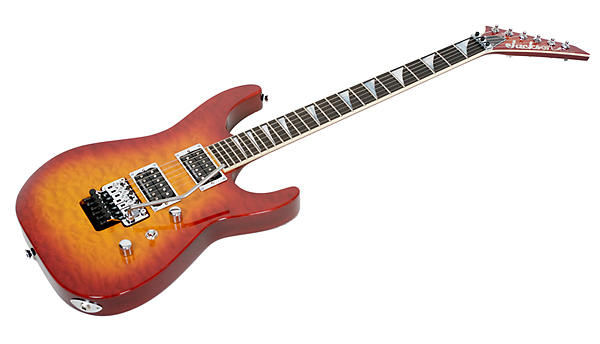 The Jackson Soloist is easily identifiable by its double cutaway solid body style and pointed headstock. It’s made of mahogany wood, neck-through body construction and bound fingerboard and headstock (the Jackson Dinky line of guitars are nearly the same but feature bolt-on necks). The neck provides twenty-four jumbo frets for playing those extended melodic lines, but for those of you that don’t like finished necks, this guitar may not be for you as the neck has a high-gloss finish (and paint) that matches the guitar body. Keeping it old school, the Soloist comes equipped with two “classic” Seymour Duncan humbucking pickups – a JB TB4 (bridge) and a ’59 SHIN (neck). A three-way switch selects between bridge, both, or neck. 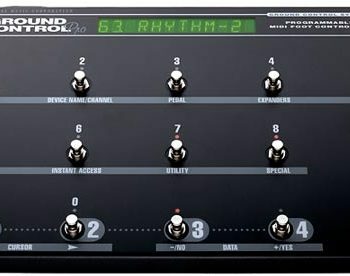 Controls include one Master Volume and one Master Tone. There is no coil tap option. Single-coil fans need to sit this one out. For a guitar of this caliber, you get premium components including CTS pots and Switchcraft switches. And to make sure your pyrotechnics stay in tune no matter how badly you abuse the whammy bar, the Soloist features a Floyd Rose Original tremolo. One of our favorite finishing touches on this guitar (though very simple and not related to tone by any means) is the Allen wrench set attached to the back of the headstock. Jackson provides a set of Allen wrenches for the locking nut and bridge system that are easily accessible for those unpredictable string debacles… It really is the small things that make us smile. Surprisingly, the Jackson Soloist doesn’t come equipped with strap locks, so you’ll probably want to make that tiny additional investment to ensure safety for yourself and the guitar during those stage dive moments. Well… we all know who Jackson guitars were built for, and that’s none other than hard rockin’ shredders. Picking up this guitar took us right back to the ‘80s when we first dreamed of having a Jackson to call our own. The feel of the neck — from the thin taper design to the extreme low playing action — provides excellent grounds for quick, blistering riffs. And the Soloist body style always has a way of turning up our attitude much like getting behind the wheel of your dream sports car. But it’s a comfortable neck, too, and despite the fact that we generally hate high-gloss neck finishes, we found ourselves routinely overlooking this detail because the guitar is just one heck of a fun hard rock guitar to play. Also, because of the compound radius, the neck has a little bit more heft and curves near the headstock, making it comfortable for those times when you’re playing rhythm guitar parts, and then it flattens out a bit as you scale the neck and enter shred solo territory. Looking deeper into the mechanics of the Jackson Soloist, the Floyd Rose is one of the most preferred tremolo units on the market. Having played numerous different makes and models of Floyd Rose-style tremolos, the Floyd Rose Original has some play in it where the tremolo arm is seated into the tremolo block if you set the tension loose enough for the arm to swing freely when not in use (as opposed to being anchored in place where you position it). This play makes it nearly impossible to obtain smooth and subtle vibrato effects on clean passages because you can actually feel the slack within the seating of the arm and hear the rattle. Once we tightened the connecting collar around the arm, we eliminated this issue, but this of course meant that the arm wouldn’t swing out of the way when we were done with our best Chris Isaak impressions. This is definitely a both-sides-of-the-coin, love-it-or-hate-it issue that Floyd Rose users routinely debate. For its intended use in rock and metal, one reward of this tremolo characteristic is that it provides an interesting sonic effect when you depress the arm and let go of the arm completely (“fling it”) or pull and release as if jabbing at it. By doing this, we could easily obtain that bouncing note effect, almost like a rapid fluttering that many other tremolo units can’t produce. The set of .009 strings made easy work of string bending. 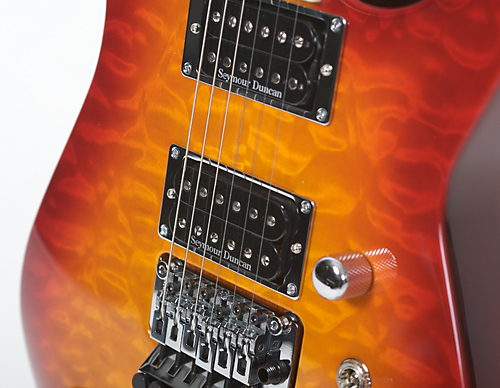 The pickup selector switch on the Jackson Soloist is positioned between the volume and tone control. From a usability standpoint, there is a lot going on in that area of the guitar: the volume and tone controls, pickup selector, and the loose-hanging tremolo arm. We would prefer our pickup selector to not be tucked behind the volume knob for rapid pickup switching, as the position made it difficult to change pickups quickly in mid-song when we had our tremolo arm swinging freely. For review purposes, we plugged our Jackson Soloist into a few different amps for comparison – A Mesa/Boogie Lonestar, Road King II, and a Bogner Ecstasy. Needles to say, everything sounds great through those amps, but seriously, these amps really deliver every aspect and nuance of the sound spectrum a guitar is capable of producing. Though all amps provided slightly different tonal characteristics, we’ll focus on the tonal spectrum provided by the guitar itself. As stated earlier, the Jackson Soloist was purpose-built for the rock music genre. However, we still found some great crossover tonal features that would lend this guitar to other musical genres as well. Taking into consideration the body design, Seymour Duncan high-output pickups, and the Floyd Rose tremolo, the guitar produces a very bright tone with plenty of sustain and defined attack. 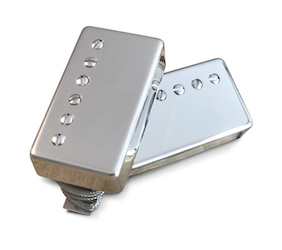 Playing through our clean channels, the bridge pickup sound provided a very high end, crisp characteristic. In some aspects, there is a slight hint of acoustic guitar coloration, but overall, the tone was clear and even sounding. As this is a humbucker pick-up, the attack is clear and precise without the compression you might find in a single coil pickup. Changing over to the combined pick-up selection, the tonal spectrum changed to a very Strat-like characteristic and almost sounded like we were playing through single coil pickups, but without any dip in volume or the buzz. Again, we could hear the slight hint of acoustic guitar tone in the body of the sound. Switching over to the Neck position pickup, the sound and tone was more consistent with other solid body guitars, but didn’t quite get as warm, dark and round sounding as a Les Paul. Still, the sound was clear and provided a slightly scooped tone, making it more characteristic of a Strat without the mushiness of a single coil pickup. Switching over to the overdrive section of our tube amps, the Jackson Soloist really bloomed into a singing monster, especially when playing single note melody lines in the bridge pickup position. The tonal character and presence of the guitar has the ability to cut right through any mix. And when playing tight rock rhythms, the percussive attack was well defined and clearly heard. The guitar had excellent note separation that we could hear while playing complex chord voicings with high gain, essential for picky prog rock guitarists. In selecting the other pickup positions, the tonal characteristic always retained the same attack and presence, but seemed a bit less smooth. In addition, we tried to clean up the overdriven sound by rolling off the volume knob. The technique wasn’t as effective with the Jackson Soloist as we’ve found with some other similar guitars. The attack and quality of the sound diminished along with the volume. In typical use, however, we almost never roll the volume off on guitars like this since we favor multi-channel amps for tonal variety, but for players who rely on single channel amps and a volume roll-off, you might not be as happy with the guitar’s tone as we were for our style of play. Though the Jackson Soloist is built for the shredder and heavy rock musician, playing the guitar through a less aggressive amp can make this guitar adaptable to other styles of music. Playing through our Mesa/Boogie Lonestar amplifier, for example, the tonal characteristic was less aggressive in the dirty channel and produced more suitable tones for fusion styles of music. The Soloist never lost its rock edge, but just presented it at a much tamer level. The Jackson Soloist was supplied with a detailed User Handbook that listed every aspect of guitar care including neck and intonation set-up, Floyd Rose adjustments, and care for the finish of the guitar. There is plenty of documentation and support available via the Jackson Guitars website. The Jackson Soloist SL2H-MHAQ (MSRP $3,099.99) sells for approximately $2,400, and there are numorous options for USA-made and foreign-made Soloists at lower price points if you don’t need the spectacular quilted top. Considering the build quality, playability, and premium hardware (not to mention the fantastic flamed top), we think the Jackson Soloist delivers excellent bang-for-the-buck compared with other premium guitars in its class. 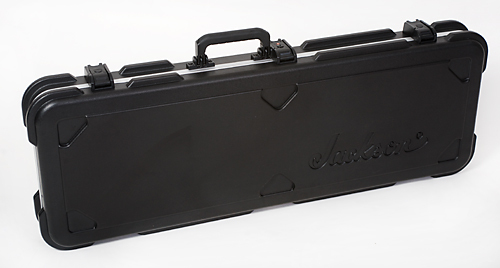 Let’s not forget the very practical and high quality Jackson/SKB flight case that’s included (and sells for approximately $120 in the general-purpose version). This premium case is equipped with a TSA security locking system, rubber seal to keep out water, and a pressure release valve for high altitudes (that’s airline travel, not high jump playing). In the event of a water landing, feel free to use it as a floatation device.